You are here: Home / Reviews / Shaving Reviews / Wit and Wisdom – Deal or Dud? Wit and Wisdom – Deal or Dud? No matter what the occasion, not much beats getting gifts from those who know you and understand your addiction to wet-shaving. It’s a time when they pay to have you try new stuff. How awesome is that? I have family members that have graciously decided to feed my need for new shaving supplies, so I know that I can always look forward to trying products I sometimes haven’t even heard of. That was definitely the case with this shaving cream from Wit & Wisdom. This is the spiced cedar edition and I’m a fan of cedar, so I was pretty stoked to give it a run. Upon opening the round plastic container, I leaned in for a whiff and was greeted by some sort of perfume smell, but nothing that came across as spicy or cedar. The cream had a slightly runny consistency. But I didn’t want to judge this by the smell, so I read over the instructions. 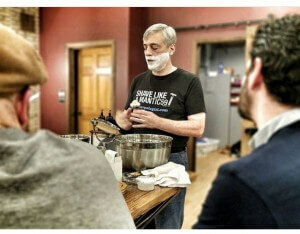 It talked about using a brush or your hands to spread it evenly over the shave area. Okay, it wasn’t a product that would produce lather, but that’s okay. I used my Semogue Owner’s Club to dip into the container and then went to apply it to my face. That’s when a realized that my brush was too wet. Hmm. I had slightly wrung it out after soaking it in my scuttle. The cream was being diluted by the water. I squeezed the brush some more and tried again. This time I was able to paint my face with the white, shiny product. I used my Slim Adjustable with a new Astra Superior Platinum, which is my combo that gives me the BBS I strive for. As soon as I started my first pass, I realized that this wasn’t a shaving cream. It wasn’t a shave gel or anything that should have the word “shaving” in the title. That’s because it was like dragging a razor across your face with only a bad hand cream on it protect your skin. I stopped about a quarter way through my first pass and swapped out blades and added more Wit & Wisdom. Neither, sadly, did anything to help make this a better shave. Out of desperation, I tried my Harry’s blade and found that instead of having one super-sharp razor blade going over my basically unprotected face, that now I had five! That experiment ended as fast as I could drop the razor and immediately start putting cold water on my face. After cooling off my irritated face and inspecting the damage, I decided to just put some in my hands to see if I could feel any slickness or cushion at all. As I had painfully learned, there was none. Zip, nada slickness or cushion or protection from this vile stuff. After giving it this test-run, I decided to search the web to see if my experience was an anomaly. I never do any research before trying any product, because I want to make up my own mind. Wow! If I had read any reviews of this product, I wouldn’t even have tried it. It turns out, you can buy this product at Dollar Tree. Okay, now I think I’m getting the idea that whoever bought this for me didn’t want to spend too much! I read reviews like “out of everything I’ve tried over the past year, this is the worst.” And “worst shave I can imagine” and my favorite: “you have to be curious, foolhardy or masochistic to try this cream.” So, no. It wasn’t me. Turned out this gunk is made in China and maybe could pass for a cheap cold cream there. But for a shaving cream, it’s terrible. There’s very few products that I decide I will toss in the trash rather than subject myself to it again. In fact, I’m not sure of the last one I did throw away. I can always steel my resolve and deal with a characteristic I don’t like as long as it leaves me with a good shave. That means at least it has one redeeming quality. Wit or Wisdom, doesn’t even have one going for it. It’s going in the trash as soon as I’m done writing this. Bottom line: don’t even waste a buck. It’s a DUD! Uh oh. It’s got the dreaded parabens. It also has alcohol, which dries the skin. No thanks. I also gave W&W a shot. As you say it’s sold in Dollar Tree, a store my frugal better half frequents quite often. I was with her a couple of weeks ago and spotted the W&W. Laid down my buck and took it home. A couple of days later, I broke it out to look it over. As you said, no smell of cedar. Okay, I figured I’d do a test lather. Went for the almond sized dollop and got a runny mess. All I needed to see. Off to the trash. Lesson learned. Sorry it got to the shaving stage for you. Good to see an honest review. Ingredients are not that good. Think a plain oil like olive oil or grapeseed probably do better. It has alcohol which probably dries skin. Dollar store, get what you pay for. Wow, its good to see an honest feedback review! I sensed danger when reading the ingredients. It seems like we only get shiny happy reviews of products or the if you cant say anything nice, dont say anything at all. But just like reviews of movies and restaurants, a bad review is just a valuable as an honest review and steers me clear from making the same dang mistake! Fans of a cedar fragrance should note Anthony Gold’s Red Cedar aftershave splash from The Copper Hat in Victoria BC. The fragrance is exactly that of red cedar. Thank you for the review. It is especially helpful to see reviews about products available in brick-and-mortar stores as I occasionally get impulsive while at the local Big-Box. It’s nice to know when there is a gem on the shelf. I just assume everything that doesn’t get mention on a trusted blog or shaving forum is garbage. Thank you for being my guinea pig. Never bought a shaving cream in a dollar store that didn’t get pitched after a single shave.